In 1976, America celebrated it’s 200th birthday. I was just six at the time, but I remember a few things from the occasion. I remember wearing red, white and blue in our school picture, at the request of the school (we also said the pledge of allegiance in “those days”). I remember being down by the bay and lots of flags and the Star of India sailing for the first time in 50 years. Every Thanksgiving, our little community of El Cajon rang in the holiday season with the Mother Goose Parade. We’d listen to the local high school bands, wave at the B-list celebrities who agreed to be in the parade and eagerly await the last float…the one with Santa Claus on it. In Siena Italy, I was in town between the two Il Palio races. One evening I was sitting on the steps writing in my journal when the piazza started to fill up and a festival ensued. I stood with a group of people who started singing when their flag was dropped out the window, announcing that their horse would race in the August Il Palio. It was at that moment that I fell in love with festivals. In Japan, I participated and attended my fair share of festivals and celebrations from sports festivals at school to fire festivals to celebrate a good harvest. I have been dressed in yukata to walk WITH my Japanese friends in the parade. I have sat under the sakura WITH co-workers friend and the like to marvel at delicate pink blossoms and drink a decent amount of sake. I have sat beneath the dark sky WITH my Japanese teachers and friends to watch a two hour fireworks show, part of a regular summer celebration. And I have poured beer WITH my friends to celebrate comings and goings, birthdays, wedding and sometimes no reason at all. I was included in those occasions and I loved them all. So when I knew that I would be in Hanoi during it’s 1000 year anniversary celebrations, I was naturally excited. I’ve already expressed my disappointment leading into the celebration, the lack or organization, the lack of inclusion of the foreign community, both locally and internationally. And in this past week of celebrations, I have grown even more so. Some would say that the expats are being too negative and looking for bad things to say. But I’ll tell ya…when a city turns 1000 years old, and you don’t tell anybody how you are planning to celebrate or what festivities they can attend, when you don’t even tell them what days they may not be able to get to their place of work due to road closures or close so many streets that the already insane traffic becomes monstrous, well then…I don’t have a hell of a lot of sympathy. It’s poor event planning and it’s laughable. Mette and I did venture out yesterday to see what might be happening around Hoan Kiem Lake. We saw lots of people making laps around the lake. 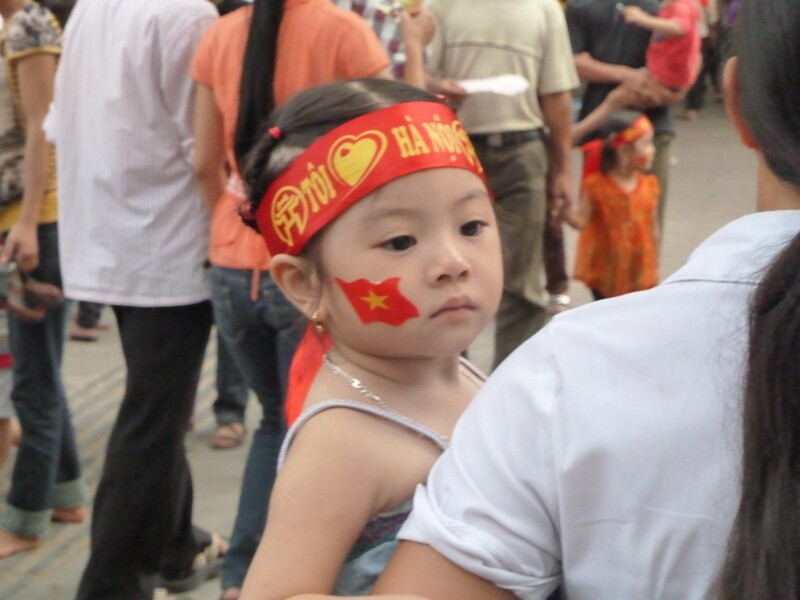 We saw lots of people wearing “I ♥ Hanoi” t-shirts and red ties around their head. One vendor put a sticker on our faces, unsolicited, and then demanded that we pay him 10,000VND. He wasn’t too pleased when we peeled the sticker off our faces and stuck them back on his sheet. We didn’t appreciate the raised voice, nor him pointing at us like we had stolen the stickers. Lots of people in from out of town sat around the park areas and watched any number of the jumbo TV screens, programmed to tell the story of Hanoi. I did take some pictures of some funny and rambunctious boys, but that was only after their parents called for me to take their picture when I was actually trying to get a picture of the crowds gathering lakeside. Mette was asked to take a picture with a girl, who motioned for her boyfriend to make sure to get all of Mette in the picture (Mette is a very tall and gorgeous Danish gal). We left the area just in time, before the real crowds descended. We went past the Ho Chi Minh Mausoleum on our way home to see the set up for the big 10.10.10 parade site. And so this morning, I watched on TV the ceremony, the parade of military and cultural troops and birds on roller skates, dragons and flags and flowers moved and shaken for the sake of pageantry, big colorful floats depicting moments in Hanoi’s history, and I’m not sure how many of the same exact picture of Ho Chi Minh. One of the most enjoyable moments on the TV program was the last 15 minutes where they showed numerous old photos of Hanoi. That was really interesting and culturally appealing. And so now that the celebration is nearly over and it is assumed we will all go back to our normal lives tomorrow, I have to wonder what everyone in Hanoi, in Vietnam thinks of the overall celebrations? What will people here remember? What will they take away from this? I can tell you that while initially I was super grateful to be here on this momentous occasion, I really have nothing to boast about. I didn’t celebrate WITH you, Hanoi. And again, that’s such a shame, because I really wanted to. Get free education and updates from Bright Life Media. E-news contains exclusive content for subscribers only. Say YES to a Bright Life now! © 2015 Shanna Bright. All Rights Reserved.